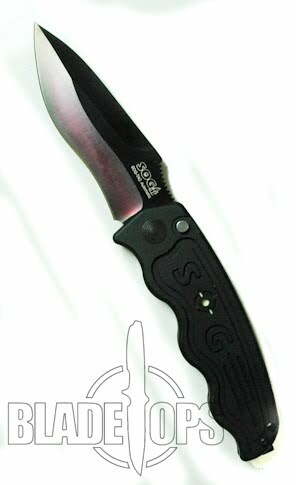 SOG just released their newest two models in the SOG-TAC line of automatic knives. The 05 and the 06 share the same dimensions as the earlier models 1 through 4 but they are built with a drop point blade tip. If you have never tried one of the SOG-TAC knives, as Ferris Buhler once said, “I would highly recommend it.” These knives have several things going for them. They are fast. They are relatively light. And they are almost unbelievable thin. This makes them fantastic as every day carry knives. These knives are very apparently built for tactical situations but they perform in every day situations also. In fact, I carried one of the earlier models for about four months and it still is one of my favorite every day carry knives. The new models come with a stainless steel finish blade (05) or a tactical black TiNi finish blade (06)–your choice. Next Next post: Tumult OTF Knives back in stock!